Israr Khan carries more than 15 years of rich experience in the industry and services sector. 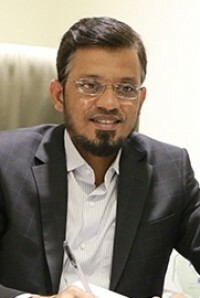 He is responsible for synchronizing the finance function of the organisation and building a bridge between top management and different departments of the company. He also makes company policies and procedures with strong internal control process which adhere to achieve the desired objectives. He guides the management on all financial aspects. His core competencies include cash flow management, forecasting and budgeting, financial reporting, technology integration and analytical review. Israr Ullah has strong leadership skills, a participative management style, a strategic view on financial issues and professional maturity. He is known for his analytical and problem solving skills and has provided reliability and integrity in performance. He is a member of different accounting and social bodies. He graduated from JCI Japan Academy of Leadership and conducts motivational trainings on career guidance, leadership and social issues.